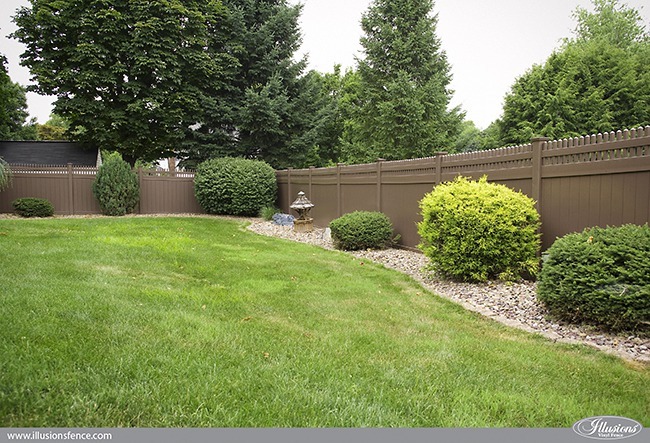 Brown PVC Vinyl Privacy Fence Is the New Awesome! Brown. PVC. Vinyl. Privacy. Fence. The color brown has always been around, but not like this. 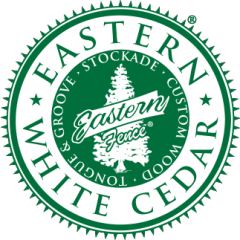 Grand Illusions Color Spectrum actually has six different shades of brown PVC fence that can be Mix ‘n’ Matched to create your own custom dream fence. Brown (L106), Tan (L102), Adobe (L108), Brownstone (E112), Prairie Dust (E113), and Desert Sand (E123). 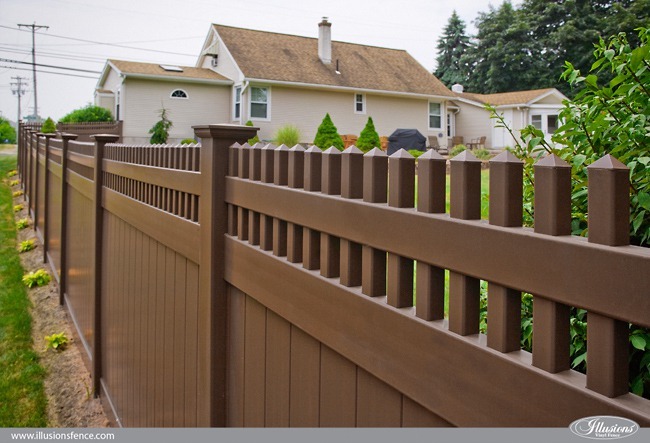 Check out the Illusions Fence Designer App to try out a few of your own brown color options. This terrific photo shows the world that yes, vinyl PVC privacy fencing does come in good old solid Brown. This is the Grand Illusions Color Spectrum Brown (L106) Tongue and Groove Privacy fencing panels with Classic Victorian Straight Top Pickets. 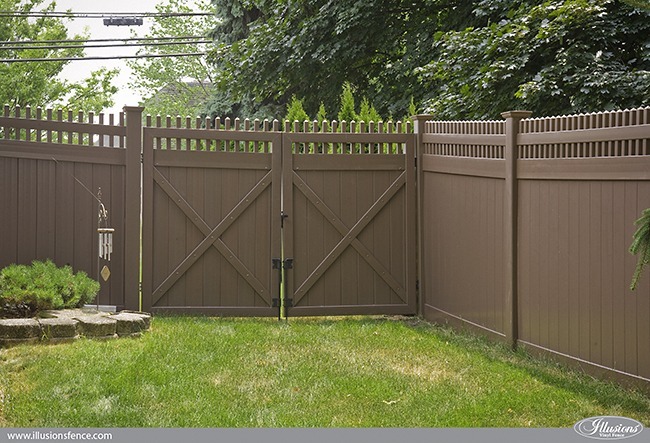 Just like the Illusions Vinyl Fence is available in Brown, so are the matching walk and drive gates. Notice these VDG3700-56 PVC drive gates have been correctly installed and are shown with two drop rods. One on each gate. 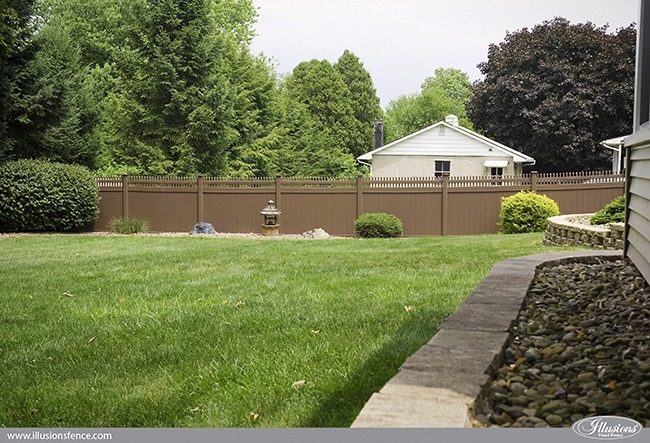 Your neighbors will be thanking you for installing this “neighbor-friendly” style of brown Illusions Vinyl PVC privacy fence. Both sides are equally beautiful and look exactly the same. Got something unsightly you’d like to hide with your new brown pvc vinyl fence? Create an enclosure out of your fence. 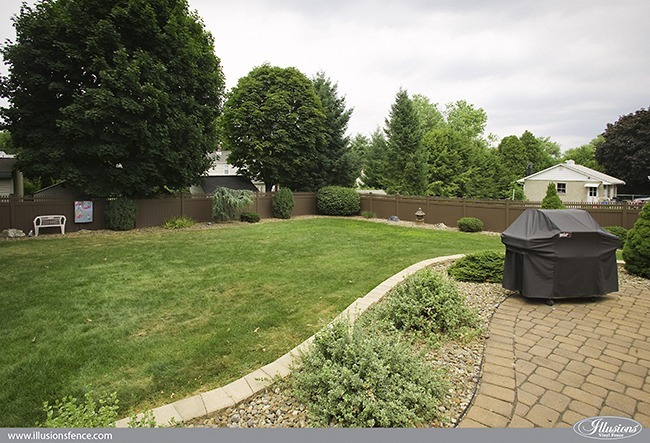 This particular enclosure was created out of a single section of Illusions V300-6L106 Brown T&G Privacy fence. 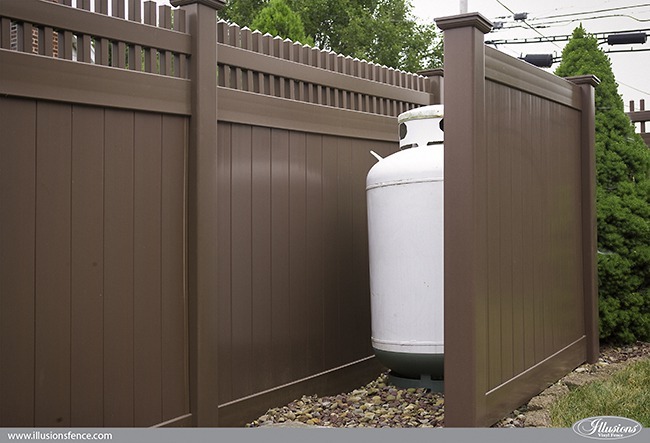 Hide your propane tanks, trash cans, dumpsters, or whatever else you can think of with fencing panels.